Sleeping on your stomach is more likely to cause you to have a restless night sleep. Not only can it be difficult to get the rest you need, but the stomach sleep position can cause strain to both your neck and lower back. Sleeping on your back can cause back pain, especially if you already have back issues. It can also aggravate any issues you might have with sleep apnea or snoring. If you sleep on your stomach but with your arms wrapped around a pillow below your head, then according to some research, you are likely to have an outgoing and sociable personality. Unfortunately, you may not be as open to criticism as others. If you sleep with your arms down and close to your body, then you’re likely to have a quieter personality. If you sleep with your arms and legs spread out, then you’re probably a good listener and are less likely to want to be the center of attention. If you sleep in a fetal position, then your personality is probably going to be more on the friendly and sensitive side. The fetal position is also the most common position for women to sleep in and they are twice as likely to sleep this way than men. If you sleep on your side but with your arms out in front of you, then research shows that you’re likely to be openminded but stubborn about changing your mind once you’ve come to a decision. 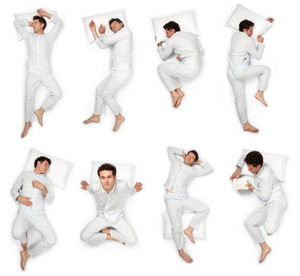 These are seven facts about sleep positions that you probably didn’t know about. Find out more about how sleeping can affect your health and for health advice in general, visit us at The Benefits Store today.